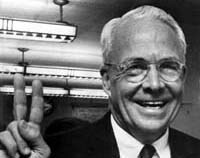 Atlanta mayor Ivan Allen Jr. was born on this day in 1911. In honor of the 100th anniversary of his birth, we highlight a few of the primary resources found in the Digital Library of Georgia related to Allen and the life he devoted to Georgia’s capital city throughout most of the twentieth century. Ivan Allen Jr. was born on March 15th 1911 in Atlanta to parents Ivan Allen Sr. and Irene Beaumont Allen. Below is his birth announcement from the March 16th issue of the Atlanta Georgian which can be found in the Atlanta Historic Newspapers Archive. During the first half of the twentieth century, his father was a prominent businessman in Atlanta and after he graduated from Georgia Tech, young Ivan joined the family business. He eventually took over the Ivan Allen Company upon his father’s retirement in 1946. His influence in the city’s business community grew and in 1960 he was elected president of the Atlanta Chamber of Commerce. In 1961, Ivan Allen Jr. ran for the open mayoral position in Atlanta and won the office over future governor Lester Maddox. The political cartoon to the right (from Richard B. Russell Library’s Baldy Collection) depicts the first of many political battles the two would wage in Atlanta. 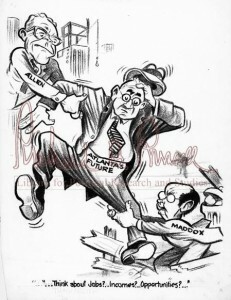 The division between Allen and Maddox throughout most of the decade was representative of the split in the Democratic Party in the South during the 1960s. Atlanta experienced a period of great economic and infrastructural growth during Allen’s two terms as mayor. Under his leadership, over fifty new buildings were added downtown, interstate highways were introduced, the Hartsfield International Airport was expanded, and 22,000 new jobs were added to the city’s workforce each year. 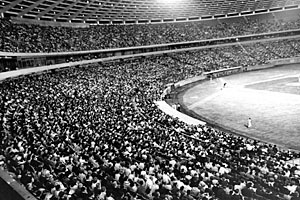 Allen also oversaw the construction of what came to be known as Atlanta-Fulton County Stadium (below) and in 1965 he coaxed the Milwaukee Braves into moving to Atlanta to play there. The Atlanta Falcons and Atlanta Hawks were also established in the city during his tenure as mayor. Ivan Allen Jr. was well known for his progressive stance in regard to civil rights in Atlanta. As president of the city’s Chamber of Commerce, before becoming mayor, he worked with the city’s business leaders to desegregate lunch counters. Upon taking office, he embraced former mayor William B. Hartsfield’s lead in promoting Atlanta as “the City Too Busy to Hate.” During his first year as mayor, he desegregated City Hall and removed racial barriers in the city’s police and fire departments. In 1963, he was the only southern elected leader to support the public accommodations section of what would become the Civil Rights Act of 1964, and he testified before Congress to convey that support. Allen was also an ardent supporter of the work of Dr. Martin Luther King Jr. and had the unfortunate duty of notify Coretta Scott King of her husband’s assassination in 1968. Below is a video from the Civil Rights Digital Library of Allen escorting Mrs. King to the airport after she received the news. Allen stepped down as mayor in 1970 after serving two terms, but continued his work as an advocate for the city of Atlanta until his death on July 2, 2003. To learn more about Ivan Allen Jr., take a look at his article in the New Georgia Encyclopedia. He also wrote an autobiography in 1971 called Mayor: Notes on the Sixties about his experiences as the mayor of Atlanta during one of the nation’s most turbulent decades. In anticipation of Martin Luther King, Jr. Day, a quick reminder that the Civil Rights Digital Library has a large and diverse collection of resources about the man and his legacy. 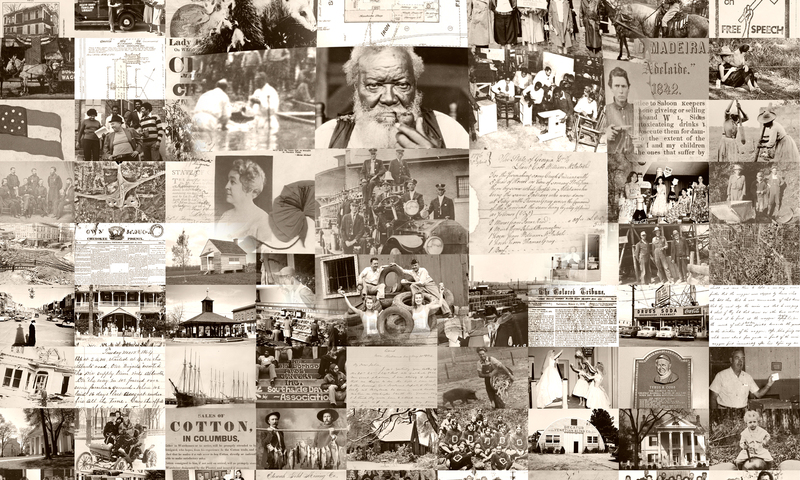 Visit King’s page at the CRDL to find videos, photographs, sound recordings and more.